June Stevenson was an instant convert to Nordic Walking. With 22 years experience within the health and fitness sector, she has been involved in many sporting and recreational pursuits. She has been the captain of the NZ Combined Services basketball team and, as a runner, completed both the Rotorua and New York marathons and the Sri Chimnoy 6 hour endurance race. She has competed in many other runs, walks and cycle events. As a fitness trainer, she has prescribed exercise programmes for the general public and for elite athletes. She has also taught both group exercise and yoga classes. Accordingly, she was well placed to analyse the benefits of Nordic Walking. "Within the first 45 minutes of trying Nordic Walking, I was absolutely hooked. All of the alleged benefits were very apparent to me. I had been practicing and teaching yoga at the time, and I particularly noticed that with Nordic Walking, my stride was longer, which meant that the hip muscles were lengthening. This may be particularly beneficial in releasing lower back tension, as those hip muscles attach to this area. I also noticed how my back posture was naturally more correct, and of course the arms and torso had to 'walk' as well!" In 1997, the Finnish Olympic X- country team, worked with the ski pole manufacturer, EXEL, to modify their skiing poles into walking poles. The purpose of this was to allow the skiers to maintain their training throughout the summer months. Nordic Walking was born, and quickly became a mainstream activity throughout the Scandinavian and Central European countries. It is estimated that over 8 million people are now Nordic walkers! Furthermore, EXEL worked with fitness leaders in Finland, The Netherlands, Germany and the USA, to develop a certified instructor-training programme. This was to ensure that the authentic method of teaching Nordic Walking was established. June has been working closely with this programme, and has traveled to the UK and Europe to develop her expertise. 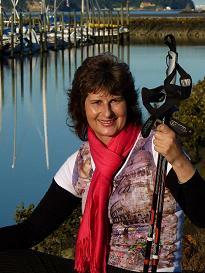 As a result, the International Nordic Walking Association has certified her as New Zealand's first National Coach. June says; "From the outset, I could see that it was important to be able to instruct people on how to achieve the correct technique. I sought out the teaching programme from the original experts, who continue to lead in this area. The International Educational Committee only certifies health and fitness professionals. I was concerned that there would be enthusiasts coming into the industry that set themselves up as instructors, when they have no health or fitness background." She adds that only high-quality Nordic walking poles should be used. They must be lightweight, have good vibration dampening qualities and ergonomic handles. Tramping poles are NOT Nordic walking poles! When watching June instruct a group of new trainees, it is quickly apparent that, without proper guidance, new people really have no idea of the technique. An instructor must have a good understanding of biomechanics and be able to give feedback to each individual, in clear and simple language. Managing a diverse group of people in a class, which can travel over several kilometers, also requires good teaching skills. June is very skilled in this area, and is constantly developing her teaching skills to keep her instruction innovative. As a veteran of the fitness industry, June has a deep understanding of the Kiwi psyche regarding physical activity. She has studied the problems associated with motivation and exercise adherence and weaves the threads of habit-changing strategies into her teaching. She also delivers seminars on this topic. June is qualified to teach the International Nordic Walking Association Instructor programme to health and fitness professionals who wish to become Nordic Walking Instructors. This programme has received the highest level of continuing education credits for a programme of its type, from the NZ Register of Exercise Professionals. Furthermore, she has started the Nordic Walking Fitness Association of New Zealand (NWFANZ), with the purpose of ensuring educational standards of instruction are maintained. By taking on an activity that was completely unknown to New Zealanders, June is a true Kiwi pioneer. Her earlier career as an investigator (a Detective in the NZ Police) has stood her in good stead. She says, "I have used my investigative skills to seek out quality training and the best products worldwide." "Nordic Walking is magic. Of all the activities that I have tried, this gives me the greatest buzz. I see people attracted to Nordic Walking that would never do any other activity and their exercise adherence remains high. Many broken-down runners and walkers, whose upper body posture is terrible, comment on the benefits of using poles."